Oh my gosh! This is so cute, and it's such a great idea. I want to get one for my newest granddaughter. 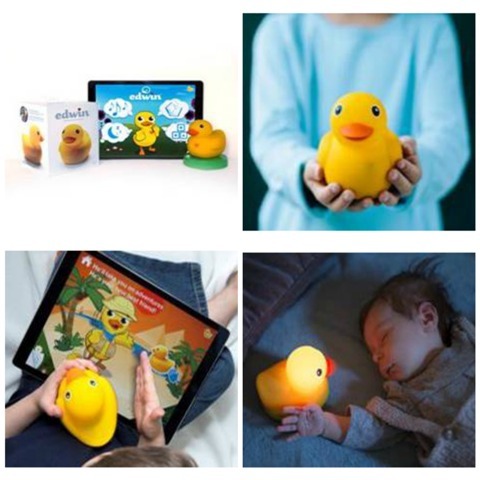 What a wonderful toy and I thought it was just a nightlight when I read this post. I wish Edwin was available when my kids were little; he would have spared me from a lot of bedtime drama! This is neat! I need this for my daughter. She has started acting scared of the dark. Wow. This would make a great gift for my niece in a year or two. I'm looking it up online now. I do live that rubber ducky and think he would make a great gift for the younger set. I can just imagine their delight when he is able to respond to them.